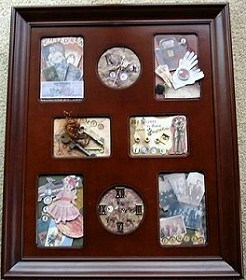 I love to think �outside the box,� when it comes to scrapbooking and here I have created some beautiful keepsakes using frames. You can use any size or shape when it comes to them, and here I will take you through some general guidelines to help you create you own special keepsakes for you or as gifts for loved ones. Choose your frame and just like a layout, gather all your supplies together that you would like to use and incorporate into your work of art. 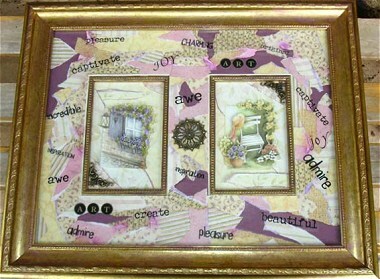 With the three frames shown here I have not used any photos therefore I have just used a lot of different embellishments etc, to fill each area in. You may chose to use photos in your frames and using your photo as the main focus add extra trims and embellishments as desired. Scrapbooking papers, paper tole patterns, stickers, 3D embellishments, fibres, tags, ephemera, chalks, paints and inks are just some of the things you can use to decorate your frames. Remember though, the depth of the frame will determine what you can use. 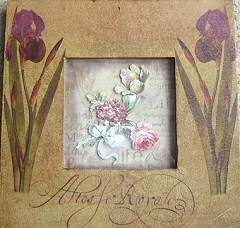 If your frame is very flat then using three-dimensional embellishments may not be possible. Carefully remove the back cover of your frame, remove the paper insert that comes with each frame and then set the glass sheet aside for now so it doesn�t get broken. Using the paper insert as your template measure and cut mat to size using your choice of paper. If you are using a multiple frame, or a single frame where the placing of the photo is smaller then the actual frame size for example: the frame may measure 10 x 12cms and the photo area may only be 8 x 6cms, then measure a little extra (about a cm all round) so it will sit better once it has been mounted to the paper insert upon finishing. If your frame is the same size as your photo area you will not need to use the paper insert to attach the decorated mats. For a multiple frame, work with each area measuring and cutting mats to size then add trims and embellishments, etc as desired. When each has been finished and you are happy with them, attach each mat with photo tabs to the paper insert/template that came with the frame. Now insert the sheet of glass into the front of the frame. Next, insert your decorated mats adhered to the paper insert. Before you put the back on securely, check to see that everything is sitting correctly. Insert the back cover into the photo frame and secure it. Now all you have to do is hang it on your wall or give it away to that someone special.